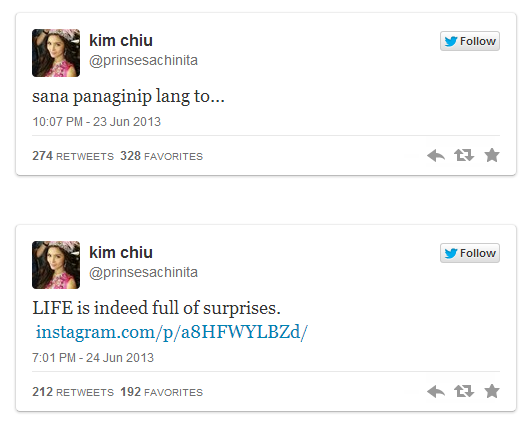 Popular actress Kim Chiu's ma died last Sunday, June 23, 2013. She is 50 years old. Kim Chiu together with Xian Lim went to Cebu last Tuesday, June 25, 2013 to mourn the death of Kim's mother, who died after suffering a ruptured brain aneurysm. Kim Chiu’s mother reportedly suffered a heart attack and fell in a coma. She was pronounced dead Sunday due to a ruptured brain aneurysm. According to reports, Kim Chiu's family and relatives gathered last night to pay their respects and honor the late Louella Yap Chiu, whose remains were placed at the Cosmopolitan Funeral Homes in Nivel Hills, Cebu CIty. Two men in black guarded the entrance of the chapel. The father of actress Kim Chiu, William Chiu Jr., defended the Kapamilya star after she had to leave the country earlier today despite the death of her mother Louella Yap Chiu. Chiu’s father said Kim would have wanted to stay for the wake, but she and her sister Lakam had to fly to Thailand today, Wednesday, June 26, 2013 to shoot a commercial which was negotiated two years ago. He said her daughter will try to convince the product owner and advertisers to let her return to Cebu sooner so she can pay her last respects to her mother. Louella Yap Chiu will be laid to rest on Saturday, June 29,2013 at CemPark in Banilad, Cebu City. Kim Chiu’s father said the burial date can't be moved because they have already consulted a feng shui expert on the matter, and that the next best date for her burial will fall on July 5, 2013. William Chiu Jr said Kim left Cebu with a very heavy heart. Last April, Kim visited her father who has another family in Romblon. Kim and her father were reunited recently after not communicating for five years. According to Kim's father, he and his daughter are still catching up with each other. He also set the facts straight and defended the actress from allegations that she never cared for her ailing mom. He said Kim and her family only knew about the whereabouts of her mother when she was already suffering from an illness. Chiu’s mother reportedly asked her caretakers not to contact Kim and her siblings despite her condition, but the caretakers eventually contacted Kim when her mother slipped into a coma. 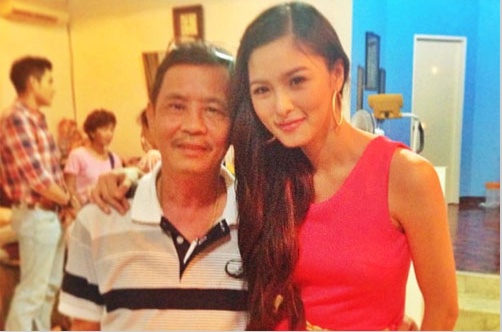 Chiu’s father said that when Kim learned about the condition of her mother, she immediately came home to Cebu to visit her. "She would arrive every dawn and return to Manila in the morning for work and back again here in Cebu," the actress’ father said. He added that Kim would talk to her mother in the intensive care unit (ICU) as if she was listening. “Kim was her mother's favorite. It was painful for Kim,” he said. He recalled that Kim wanted her mother to recover so that she can stay with the actress in Manila. Relatives and fans of the actress continue to visit the wake of her mother in Cebu. Kim and her siblings grew up with their paternal grandmother since their parents had separated. Kimberly Sue Yap Chiu is the real name of Kim Chiu. Support for Kim filled social networking sites Twitter, Instagram and Facebook as fans expressed their sympathy and offered prayers for her and her family. If you could still remember, Kim Chiu was a 16 year old student of Cherish School, a private school for children of Filipino-Chinese families in Cebu City when she shot to fame by winning the top spot in the reality ABS-CBN’s reality series Pinoy Big Brother Teen Edition in 2006. She later moved to Manila to embark on a career in movies and teleseries in ABS-CBN. Kim Chiu's latest teleserye, Ina, Kapatid, Anak, where she starred with the new girl friend – Maja Salvador – of her former boyfriend Gerald Anderson just ended last week.